Looking for a spring semester internship that will expand your horizons and fuel you with free coffee? Apply for our Campus Engagement Internship by Wednesday, November 29! Questions? Contact Alex Duffant. Looking to spend a nice Shabbat lunch among Hillel peers? Searching for new friends? Hoping to 'run into' that cute student you met at Friday night dinner? Come celebrate Shabbat Lunch with your Hillel friends in Collegetown! Fill out this form by 11/26 and we will set you up at an apartment. Stay until the end for a communal dessert and a comedy sketch based on the weekly Torah portion! More information. Questions? Contact Chanan Heisler. Juniors - it's your turn for a fun dinner at the Kasdans! Join us for pancake making, eggs made-to-order, and more. More information. Seniors get their turn for a yummy dinner at the Kasdans. Make your own pizzas with an array of toppings and cheeses. More information. Looking for an exciting Jewish service opportunity this summer? Sign up for our Alternative Summer Break trip to Poland and Germany! 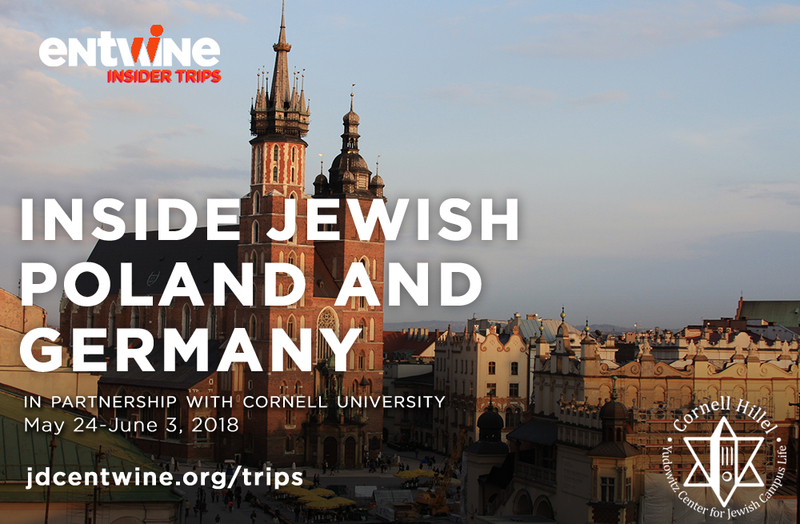 This all-inclusive trip features educational tours, conversations with local leadership, a reflective visit to Auschwitz, meaningful service work with children and the elderly, and a cross-cultural Shabbat experience with the Eastern European Jewish community. The trip runs from May 24-June 3, 2018 (these dates include travel from a NYC-area airport). Sign up by December 31 to take advantage of a special early bird price of only $700! The price goes up after December 31. FAQ. Other questions? Contact Alex Duffant. 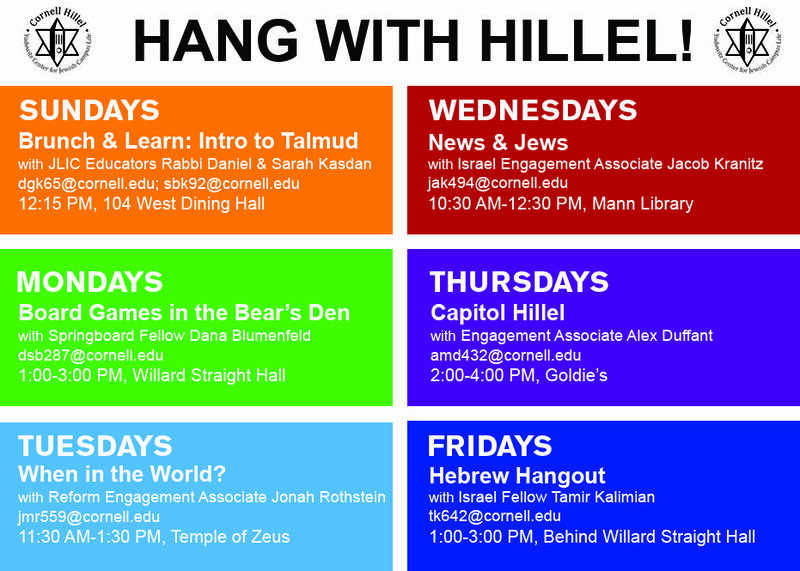 Get to know the Cornell Hillel programming staff all over campus! Sundays: Join JLIC for brunch and an introductory Talmud class! Students of all levels and backgrounds are invited to participate and encouraged to bring a friend. Mondays: Start off your week by meeting new friends over board games and food! Have a game you want to teach everyone? Bring it! Tuesdays: This Week in Jewish History: Come take a dive into the timeline of Am Yisrael and explore various topics about where we were during years past. Wednesdays: No nonsense; just some Jews talking 'bout the news. Thursdays: An informal discussion over coffee for all those interested in American and Israeli politics! Fridays: Practice your Hebrew by reading the lyrics of popular Israeli songs, learn about Israeli culture, and discuss Israeli society with coffee and delicious pastries. 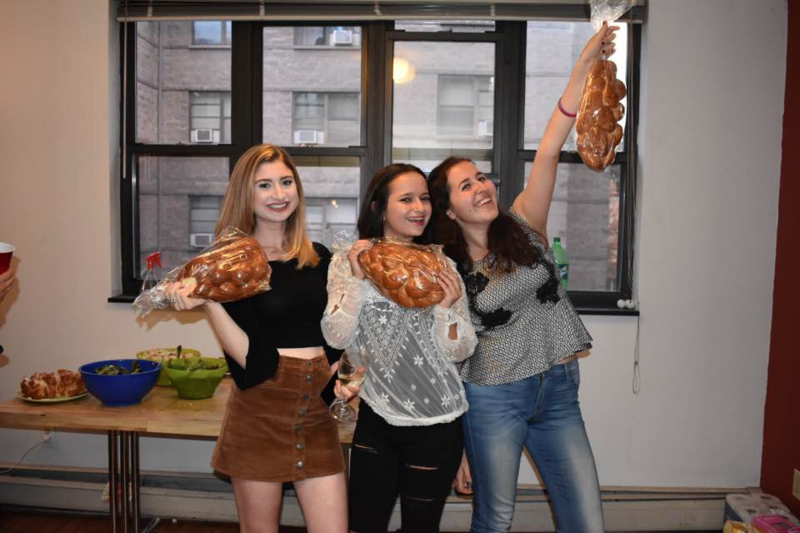 Challah for Hunger is a national organization where students bake and sell challah every week to raise money for hunger relief. Baking is every Thursday in 104 West's kitchen, and sales are 10:00 AM-1:00 PM on Ho Plaza every Friday. 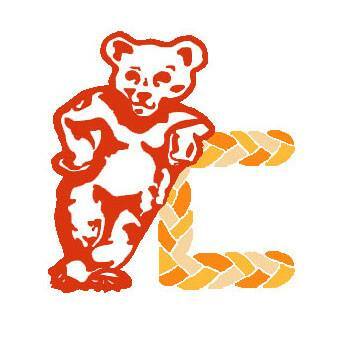 Delicious flavors including cinnamon sugar, raisin, chocolate, chip, and plain are available for just $5 a loaf. Want to host your own Shabbat dinner? 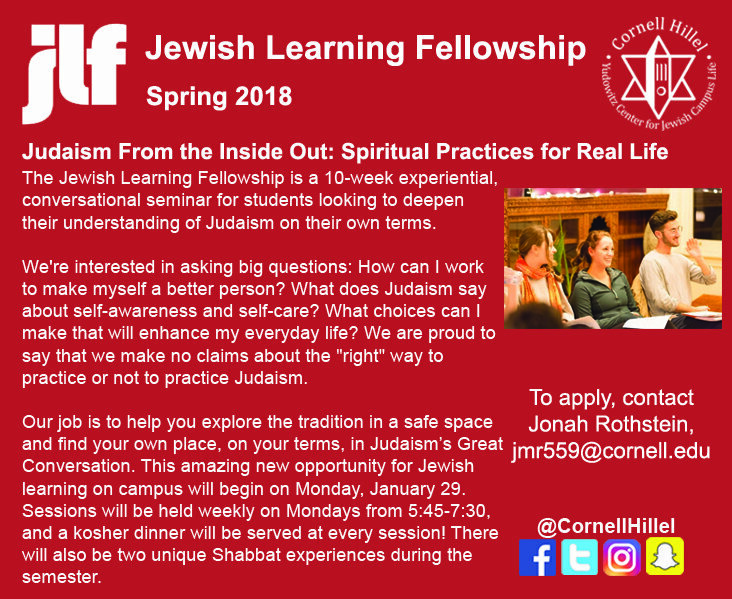 Check out our Shabbat Across Cornell program! We'll help you plan an awesome dinner, and we'll even fund you $5 per person! Fill out this form to get started, or contact Nicole Levine for more information. 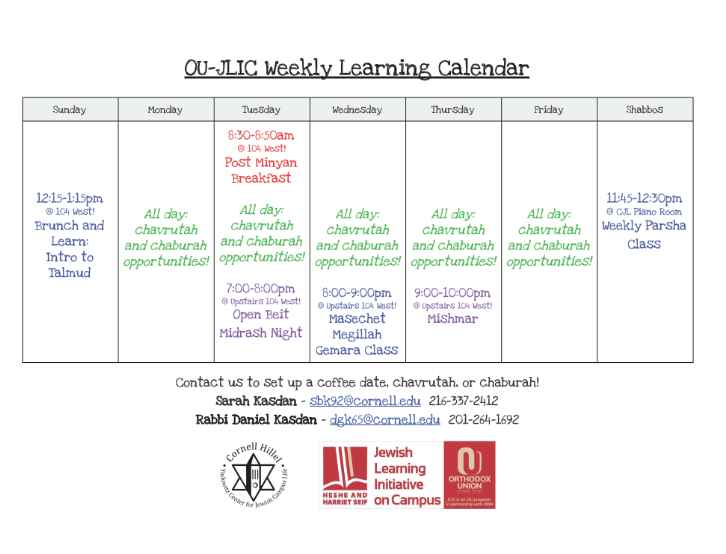 Sarah and Rabbi Daniel Kasdan are the OU-JLIC (Jewish Learning Initiative on Campus) Educators. They are interested in studying with you, either one-on-one (Chavruta) or with you and your friends (Chaburahs). To sign up to learn with the Kasdans, fill out this form. They will be offering various learning opportunities and special events throughout the year, so be on the lookout. Please feel free to contact them with whatever you need. APPLY NOW to work in Israel, summer 2018! 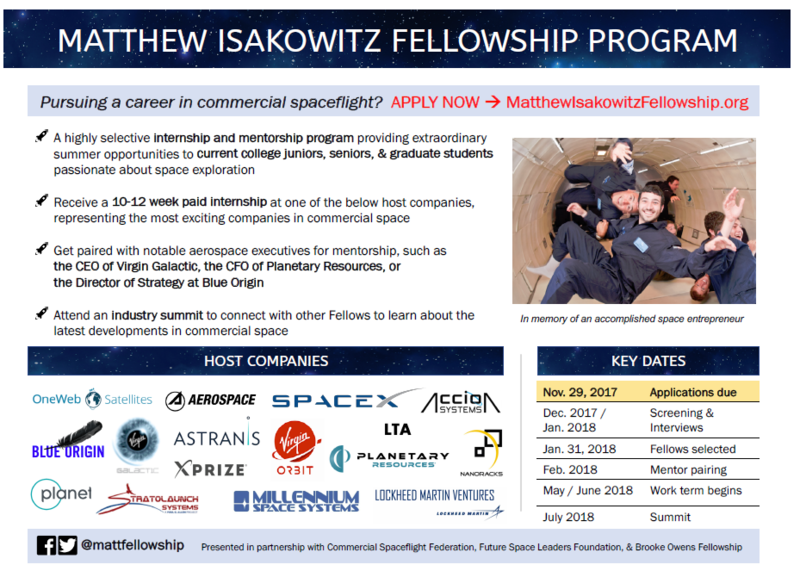 Intern for 10 weeks at a leading global company in finance, consulting, venture capital, cyber/tech, and more, OR join a tech startup boot camp and build your own venture. Develop one-on-one relationships with Israeli business mentors and peers; join a cohort of like minded Jewish North American college students. Applications are due by January 21 for regular admission. More information. Copyright © *|CURRENT_YEAR|* *|LIST:COMPANY|*, All rights reserved. Want to change how you receive these emails? Our Newsletters are emailed to alum, students, parents and other interested community members weekly. Sign up here. Have an event to add? Fill out this form.